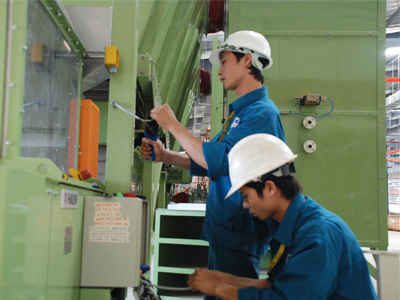 QUANPHAM has been providing maintenance services, maintenance, upgrading electrical systems in factories, workshops, such as wood processing plants, dairies, factories Tan Binh Industrial Zone, Tan Tao .. . Coming to Quan Pham, customers will receive a high quality of service, professionalism and the most prestigious. Insulating tape is not good. Noting operational logs from the client. Record the phase current value input / output load. Record capacity of each phase. Check the power source (Transformer – EVN, ..). Check the total power distribution cabinets and appliances in cabinets. Check the electrical distribution cabinets, lights, equipment directive … on the electrical panel. Check load consumption of electrical appliances, calculate the total load and output load testing to determine MCCB total consumption. Check the connection of the device. Check load distribution to adjust the phase of download. Make a list of problems to be solved (if any). Check the system log activities. Measure the input and output voltage of the electrical cabinet, combined phase sequence measurement. Try MCCB overall system power off to switch to UPS source, some of the system will power off automatically restart. Try MCCB bypass the UPS system. Check cables for server room dynamics. Noting the important electrical parameters for monitoring.